Never Enough Nails: Lynnderella Friday, Vol. 10! We made it to Friday! Even though the week didn't even start until Tuesday, it seemed like a long week to me. But it's almost the weekend and I have some sparkly treats for you today. 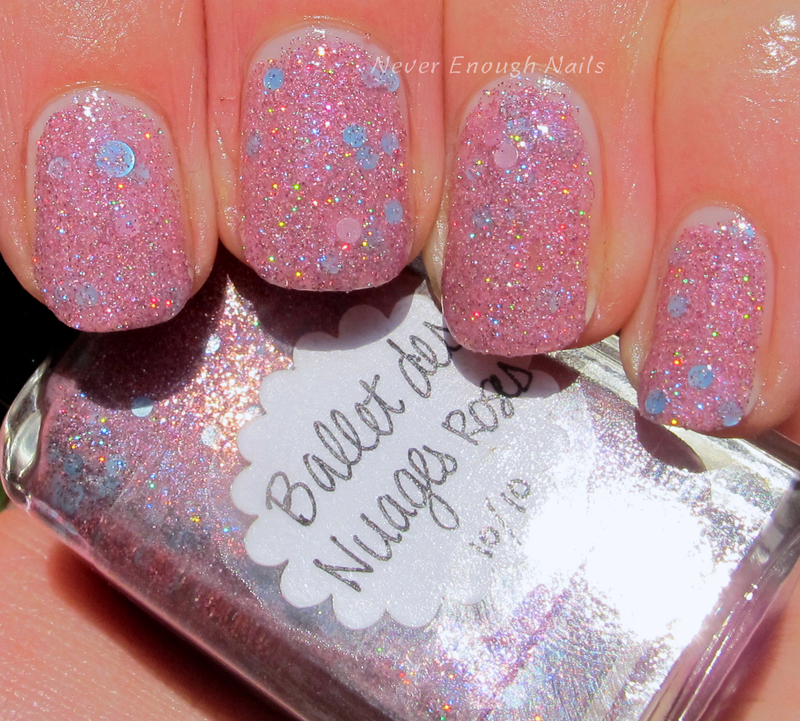 Lynnderella Ballet des Nuages Roses (Ballet of Pink Clouds) is a pretty holographic pink microglitter with soft pink and blue larger glitter accents. A lot of the accents are my favorite circle glitters, you know how I adore those! The delicate pink, holographic pink and satin baby blue circles are perfect in the pink base with pink and blue shimmer. 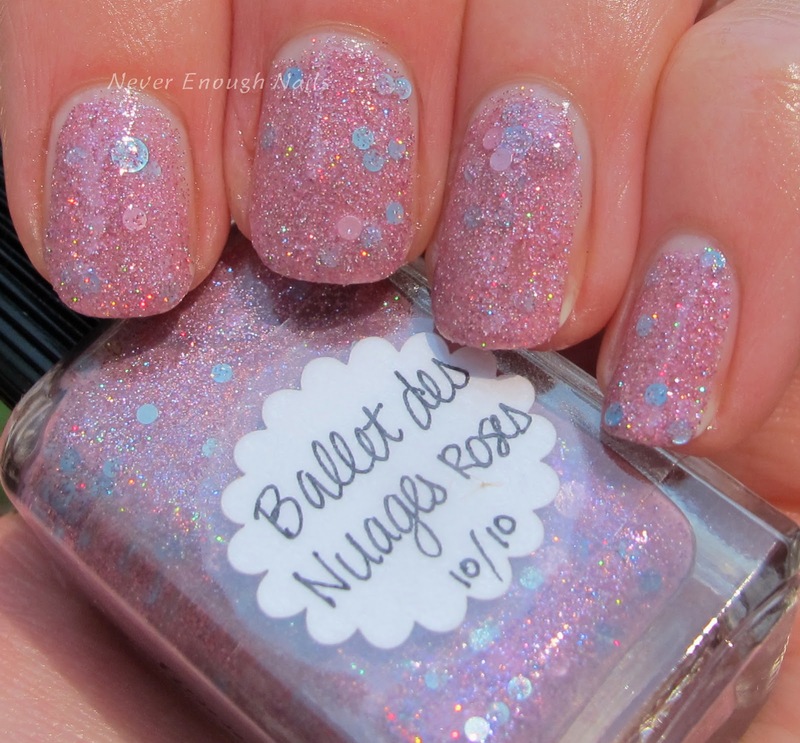 This is two coats of Ballet des Nuages Roses by itself. I tried to do mostly just the microglitter on the first coat and then add the accent glitters in the second coat. That way the end result is smoother. It was a little thicker than some Lynns have been recently, but it wasn't hard to apply the way I did it. Lynnderella does fall polish SO well and Lynnderella Full of Fall is a great example of that! Full of Fall looks like the brightly colored leaves on the still green grass of early fall. It has holo, matte and metallic glitters in yellow, red, green, white, black, a few different shades of orange, copper, red and even purple. The clear base contains lots of orange holo microglitter and has a very strong green-gold shimmer. I want to swatch this over something sheer first so you could really see all of the different colors in it. This is one coat over OPI The Beige of Reason (from the Infinite Shine SoftShades collection). Full of Fall is packed with shimmer and glitter and was still easy to apply! I use the dabbing method with most glitter toppers, including this one. Just dab a good amount on your nail and spread it around for nice even coverage. I also wanted to show you Full of Fall over a nice chocolate brown, in this case, Zoya Dea. You can see the green gold shimmer in the base really pops over the milk chocolate color. I love this combo for fall! It is just like the epitome of a fall mani for me. Full of Fall and Ballet des Nuages Roses are available on lynnderella.com. Lynnderellas are also available on lynnderella.storenvy.com. If you're looking for a specific Lynnderella and can't seem to find it for sale, definitely email lynnderellalacquer@gmail.com and Paul can help you!